Today, with our Celtic Pilgrimage we have words with a few tangents of consideration related in the way of conrete side stories. One is a story told me by this compassionate man who contributes our "Anam Chara" reflections He is currently an important teacher for us in our RCWP Canada West and one with us in our Cloud of Witnesses initiative for you. you could say and, if you examine your map of Canada, you should look for Fort St. James and Fort McMurray but I know that he was in further isolated places, "far from bishops" he has been known to repeat.. When he says that, he means that he had to invent and to do what was best in the situations with the People of God, mostly aboriginals. I atttribute his free spirit and forward looking vision of today as having first arisen from the way he engaged with people who especially required respect and adaptation to their cultures. He was that kind of pastor and it took him far ahead of his times and the times elsewhere even though to all appearances, certainly in urban areas, all would have seemed backwards. He was just off in "the mssions" others might say. When we think of it, here in BC , just about everywhere except Vancouver and Victoria is still "the missions" in many respects because of distances, scattered resources, rural populations, but this does not mean backwardness in thought and practice, necessarily. Certainly less so in today's advancing technologically globally networked world. I asked him what Sacrament of Penance was like for him prior to Vatican 2 and then how he experienced the shifts and changes and how he now understands Sacrament of Reconciliation? "I sat on a sled in a snowbank," he replied. regarding the first part of my question. Then he told the story about how he sat there with his back to the building that was the Church. No pews. Nothing in it really and the people sat on the floor on cedar branches. The people were very sensitive about respectful approach but they were not secretive. They liked to speak face to face so there was nothing about being in a shut box confessional that they would have appreciated or accepted. I found this an incredible story that told me about the compassionate heart of this priest and his understanding of the necessity of respecting and honoring, of validating his congregants personally within their cultural context.I He also told me of the tenacity of the aboriginal people in expressing their needs and expecting that they would be honored. As we know, often they were not, but that is not this story. In other stories he tells, Chris describes his rush and dash in travel much as in the Acts of the Apostles. He traveled by boat or unlke Paul ,by plane as he moved amongst mission bases. His journeys were no less dangerous.--just in case we think St. Paul's acts in his time were only for the early Christian communities..
Today Chris says, just say I am Chris Diamond from Cobble Hill.. But signifigantly for our purposes he is Irish to the core .Now he lives in a sizeable home pressed against a mountain high enough to be eye level with the eagles of our Vancouver Island. Right now it is mating season and the eaglet eggs should be hatching around April 22nd. Chris and his spouse Naomi would see all fo this seasonal activity of nature. Across most of the front of their home they have panel windows stretched high and wide. They are blessed by the eagles' flights right in front of them or from nearby, daily. and in all seasons..
What I am tellling you is signifigant for another reason. We are in the greening season as we have noted regarding Hidelgard of Bingen and Brigit of Kildaire and now Rose Mewhort recently completed a painting of the eagles in their nesting with their nestlings and we will be sending it to you soon as a jpeg. Here is what Chris wrote me for Anam Cara (Chara) as I requested whether he would share his understanding with some reference to the recently deceased and well known and loved Irish priest John O'Donohue. role in the old pre-christian and christian Gaelic outlook on life. Today it is used by members of serious spiritual associations and by quacks as well; its use received a great impetus from Joh O'Donohue's book by that name. from the hard 'k' to the throaty 'ch' sound). imagination articulates the inner friendship that embraces Nature, diviniity, the underworld, and human world as one. The dualism that separates the visible from the invisible, time from eternity, the human from the divine, was totally foreign to them. Celtic gift...(which finds its inspiration in the sublime notion of the anam c(h)ara." out the mystery of the inner landscape...Time is eternity living dangerously." O'Donohue quotes from "The Bright Field" by Welsh poet R.S.Thomas" "Life is not hurrying/on to a receding future nor hankering after/an imagined past. It is the turning/aside like Moses to the miracle/ of the lit bush." "Friendship is the naure of God. The christian conept of Gld as Trinnity is the most usblime articulateion of otherness and intimacy, an eternal interflow of freindship. Jesus is the secret anam chara of everuy indivicual." Spirit Holy Wisdom Sophia your who infill us within the Divine in the Universe Divine in the universe bring us more deeply into the soul space of anam chara. Gift us with such blessings of soul mate friendship with each other as we build our community and prepare futher for how we will emerge with our communities we astor and serve. Spirit Holy, light our imaginations and our trust of symbolism anew while integrating the gifts of our minds and our knowledge with our hearts. In a report on the state of the Roman Catholic Church in Africa, men who have affairs and father children return to active ministry while nuns are thrown out of their orders. This is yet another example of the institutional Roman Catholic church's double standard, and hostility toward women. Priests receive a slap on the wrist and nuns are shown the door. Sounds like patriarchy's centuries old deeply-embedded hatred of women continues to reign in the Roman Catholic church . Shame on the hierarchy for unjust treatment of women! Jesus who called women and men to be disciples and partners, equals in proclaiming the good news of the Gospel, would be angry at such despicable treatment of women in our contemporary church. Like Jesus who cleansed the Temple and overthrew the tables of the moneychangers, we, the community of believers, are called to rid the church of outdated clerical structures that foster sexism. Pope Benedict could begin by asking forgiveness from women who have been treated so shabbily by church leaders, and follow it up with a sincere repentance that restores Jesus' vision and the church's ancient tradition of partnership and equality for women, including ordination to a renewed priestly ministry. EXCERPT: "Priests having affairs is rampant in the church" in South Africa, said Velesiwe Mkwanazi, a former Catholic lay leader who co-founded Women Ordination South Africa and says she knows two priests with children. 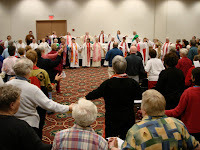 "Parishioners blame women, say we seduce the priests, but we are brought up to respect and honor men, and women can't say no to a priest who is held up to us as a fount of knowledge in daily communication with God," she said.Co-founder Dina Cormick said priests who are caught having affairs are sent on retreats or moved to other parishes while nuns caught in sexual liaisons with priests are forced to leave their orders. Roman Catholic Womenpriests call on Pope Benedict to reflect the compassion of Jesus in the Gospels, by supporting condom use to prevent the spread of AIDS in Africa. The pope, like Jesus, the Good Shepherd, must listen to AIDS victims, especially innocent women. As we know, married women and their children are often the victims of this tragedy. These women did not have a choice, and could not have refused sexual relations. While it is true that the Roman Catholic Church is actively ministering to AIDS victims in Africa and elsewhere, the institutional church 's prohibition against condoms puts lives needlessly at risk. If we ask ourselves, what would Christ do in this situation ? We might recall that in the Gospel, Jesus chastised religious authorities who made rules that put unfair burdens on God's people. Most contemporary Catholics reflect Christ's wisdom in their attitudes to church rules today. Recent worldwide polls report that Catholics support condoms to prevent AIDS. Now is the time for the Roman Catholic church to embrace the vision of fullness of life and justice at the heart of the Gospel by taking realistic steps to help prevent the spread of AIDS by reversing the ban on condom use. Jon O'Brien, president of Catholics for Choice, issued a response to Pope Benedict's statement on condom use. "As the pope traveled to Africa, he chose this moment to make what appears to be his first unequivocal statement opposing condom use. In an interview on the papal plane to Cameroon, the pope acknowledged the HIV/AIDS crisis but claimed that the distribution of condoms would not resolve the problem. In fact, he said, condom use "increases the problem. ""The pope will find that few Catholics and even fewer medical personnel agree with his stance. Several bishops in Africa, including especially Bishop Kevin Dowling of Rustenburg in South Africa, have been outspoken in their support of the use of condoms. Anecdotal evidence also suggests that many people who work with Catholic relief agencies distribute condoms to those at risk of infection. "While condoms are not a panacea for the problem, they are a critical part of the campaign to reduce the impact of the virus. Medical experts agree that the condom is a life-saving device: it is highly effective in preventing HIV transmission if used correctly and consistently, and is the best current method of HIV prevention for those who are sexually active and at risk. "For the Catholic hierarchy to deny the role that condoms play in preventing the further spread of HIV is irresponsible and dangerous. Not only that, the Catholic hierarchy has lobbied governments in the global north against the inclusion of funding for condoms in development aid programs. The result is to deny the poorest of the poor in the global south the chance of protecting themselves by using condoms. "According to a recent poll commissioned by Catholics for Choice, which interviewed Catholics in Ghana, Ireland, Mexico, the Philippines and the United States, support for condom use among Catholics is overwhelming. When asked if "using condoms is prolife because it helps save lives by preventing the spread of AIDS," 90% of Catholics in Mexico, 86% in Ireland, 79% in the US, 77% in the Philippines and 59% in Ghana agreed. Unfortunately, the Catholic hierarchy's position holds the most sway in the countries least able to deal economically and medically with the disease. "Catholics the world over unequivocally state that using condoms is prolife and disagree with the Vatican's ban on condoms. Now is not the time for the pope to be dismissing the importance of condom use. As he travels to Africa, he will face the realities of the epidemic. Let us hope and pray that he reconsiders and reverses his position, and in doing so, adopts the truly prolife position that ordinary Catholics have already embraced: using condoms saves lives." And in green underwood and cover,Blossom by blossom the spring begins. We are continuing to pray for all of you as the episcopal ordinations draw ever closer, and today we do so in the spirit of the Celts, on this feast day of St. Patrick. This feast of all things green also brings to mind our Wisdom Sister, St. Brigid of Kildare (whose feast day was Feb. 1), and indeed another Sister in Spirit/Sister of the Green, Hildegard, and the beautiful blessing from Patricia a couple of weeks ago. We would also like to begin, this week, to pray for each of the bishops-elect individually, as well as collectively, so today I offer this "witness prayer" in particular honour and upholding of Bridget Mary, who shares the heritage as well as the courage and wisdom and industry of her namesake, St. Brigid of Kildare. Green is often used to represent the fourth chakra, the chakra which hums around the human heart, and it is in the heart where, it is said, heaven and earth meet. In that coming together of matter and spirit, divine and human, Love is created and set free, to manifest inwardly and outwardly, in beauty, power and infinite possibilities. Green is also the colour of the power and delight of Nature, the natural world, a world of instinct and intuition, of creaturely kinship and interdependence. Green is the colour sunlight becomes once it has passed through plant matter with its gifts of warmth and light. 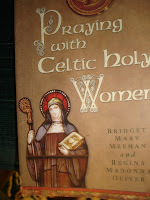 Bridget Mary, may the vigour and wisdom of St. Brigid pour through you with holy abandon! May you be strengthened and guided by the Spirit's movement within your being every step of the way, with every turn of the heel, as every new note in the dance comes to life; may the gifts of the holy ground upon which you are walking and dancing and praying grow up around you in abundance and offer themselves for your ministry. Bridget Mary, Joan, Andrea and Regina, we bless you and claim you as leaders in our dreaming/visioning/caring/enacting community of God's renewing presence on Earth. As true community, we see ourselves in you, and you in us. in the name of the Spirit who is the fire of life." In closing, let us celebrate the gifts of Green-ness and verdancy and Springtime, of Ireland, of St. Brigid and St. Patrick, and of Bridget Mary, and all the bishops-elect. May each of you, in your giftedness and uniqueness, be blessed with courage and confidence as you walk the path the Spirit of New Life is laying out before you. May you know how much you are valued by all whom you shall guide and all whose needs shall guide you in your pastoring. May the God of Audacious and Visionary Loving inspire your minds, encourage your hearts, and give you the energy of the surging Spring-time creeks, that you might take your new place, with alacrity and joy, in our growing community of Friends of God and Prophets. Amen. Thank you, all, for your brave coming-forth! I bind to myself todayThe strong virtue of the Invocation of the Trinity:I believe the Trinity in the UnityThe Creator of the Universe..I bind to myself todayThe power of Heaven,The light of the sun,The brightness of the moon,The splendour of fire,The flashing of lightning,The swiftness of wind,The depth of sea,The stability of earth,The compactness of rocks.I bind to myself todayGod's Power to guide me,God's Might to uphold me,God's Wisdom to teach me,God's Eye to watch over me,God's Ear to hear me,God's Word to give me speech,God's Hand to guide me,God's Way to lie before me,God's Shield to shelter me,God's Host to secure me...I invoke today all these virtuesAgainst every hostile merciless powerWhich may assail my body and my soul...Christ with me, Christ before me,Christ behind me, Christ within me,Christ beneath me, Christ above me,Christ at my right, Christ at my left...Christ in the heart of everyone who thinks of me,Christ in the mouth of everyone who speaks to me,Christ in every eye that sees me,Christ in every ear that hears me. Today we conclude considerations about St. Katherine Drexel racial justice worker and servant to the poor who also founded the Sisters of the Blessed Sacrament. As a foundress building a new community ,she had words to say that are very profound for us. In terms of her powers of discernment and visioning capacities she has been described as having a joyous spirit with an incisive intellect . She held these powers within the Light of the Holy Spirit and so found the way through or around difficulties such that her work and that of her community with her advanced. or women] to manifest my mission. before priests and beareded men. In RCWP, we have many instances where we have to make bold decisions as though called in the moment over against obstacles that can thwart our progress. But we are also not just a single foundress or foundeer. We are already a community of persons in founding time so that much of our advancement is also dependant on communal discernment and understanding and action in solidarity as well as autonomously. What a happy mix in our new model even as we are exploring and just getting the hang of it for ourselves and with the people we serve. PEOPLE'S COMPANION TO THE BREVIARY. Vol. 1. Carmelites of Indianapolis, 1997. St. Katherine Drexel's extraordinary boldness, vision and success in 'manifesting' (as Katherine hereself calls it) in her call and mission. I asked Judy how it was that she had found herself within the influence of Katherine Drexel's spirit, her spirituality. and her bold accomlishments in social justice and service to the poor. Judy contirbutes to our Cloud of Witnesses knowledge from first hand experience of this woman so recently canonized in the year 2000. A.D.
inner-city neighborhood in NYC. I was baptized, raised and confirmed, very active in and married in a Methodist Episcopal chruch in that neighborhood. It was an anchor fo youth and the community. neighborhood church setting. We were all set on fire in the experience of a God who loves justice and the poor. I began to know the Jesus of Liberation Theology as the Jesus who changed and formed our lives in our community. a church that set me on fire like that one did. I came into the RCchurch as an adult in a Black inner-city church in Hartford. CT. The church was on the grounds of a woman's shelter where I, now a Professor of Social Work and a social worker, provided consultation and intervention at the request of its Director, Judy Beaumont, then a Benedictine sister. that I had come home. I studied with Father Al and when I made my first "official" Communion my Pastor Mel came from California. Fr. Al invited him to the inclusive Table of Jesus and sonehow I thought that was how the church was -open and inclusive of me, of Mel, of Protestants, and other faiths as well as Catholics. I was happy. I served by counselling parishioners with and for Father Al in 'tough' situations and by teaching teen CCD. When the time came for my confirmation, we talked about a Saint's name. Father Al sugggested Katherine for Katherine Drexel and Catherine of Siena for his mother.I was moved to accept his suggestion and then studied the lives of the K/Catherines. I found that Mother Drexel's spirit rested on our people: the black, poor and oppressed of the world and the church. I felt her spirit rested on me as well. Despite her birth in wealth and by my very different life, we were now connected spiritually, forever. But little did I know then that I would aslo speak back to power within the Chruch as Saint Catherine of siena did. Yes, K/Catherine is a good name for me. I bless them both. Lee,Judy. "What Would You Like to Hear?" Let us today bless them as they bless us and ask tha Sts Katherine Drexel and Catherine of Siena accompany us deeply and powerfully on our RCWP path and that they dwell strongly within the hearts of our Bishops elect, Bridget Mary Meehan, Joan Houk, Andrea Johnson and Regina Nicolosi. May they dwell in the hearts of our ordaining bishops Dana, Patricia, Ida and Christine. May they strongly indwell in us all-- women and men internationally in RCWP. May the Jesus they knew as liberating social activist be with us all. May Spirit Holy Wisdom Sophia, who infused them intimately infuse and enlighten us just us intimately. May the penetrating power of true discernement move us forward always. From RCWP-Canada. Europe-West and from Judy Lee RCWP USA.